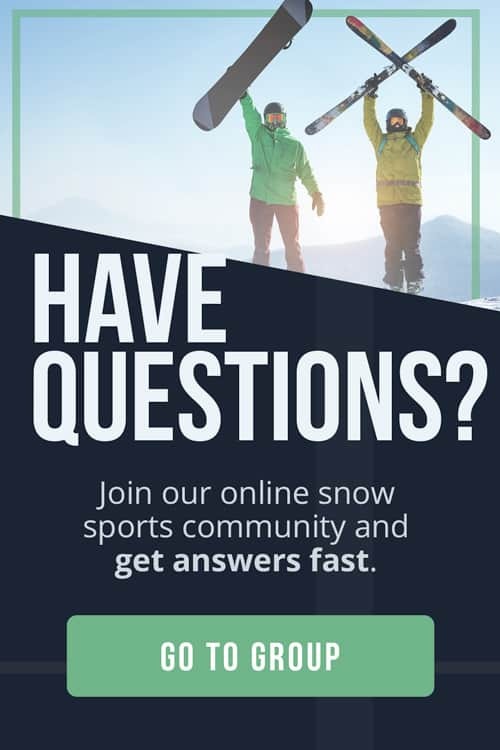 How Long Should Your Snowboard And Skis Be? Length is an important factor in choosing your skis and snowboard. Picking the perfect size not only helps you ride better but also boosts your progress by leaps and bounds. Generally speaking, shorter skis and boards are more agile and easier to turn, while longer ones provide more stability and better edge grip. So, just how long should your snowboard or skis be? The length of ski or snowboard you choose will depend on many factors. 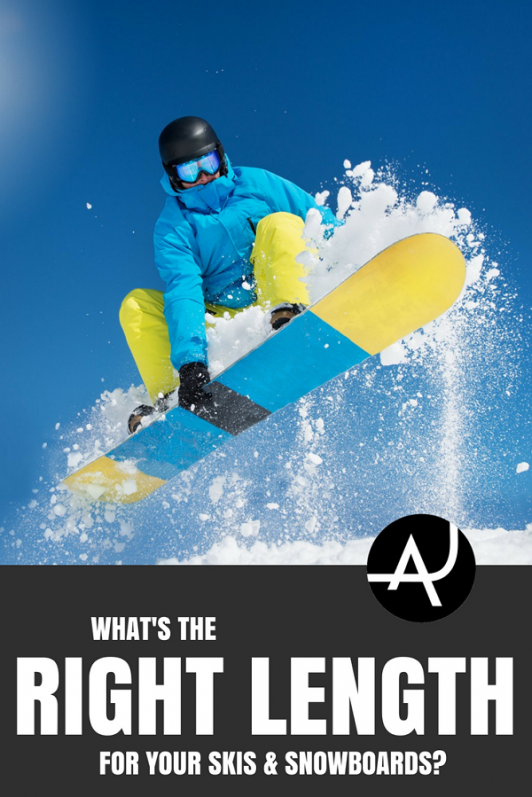 Here at The Adventure Junkies, we’ve broken down the points you should consider when choosing your ski or snowboard length. Of course, each manufacturer sizes their equipment a little differently but these general guidelines are a good place to start. 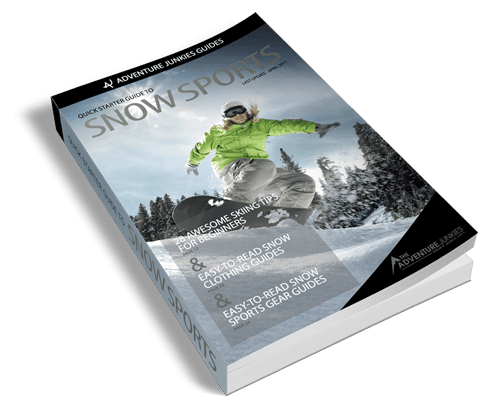 CLICK HERE to Download our FREE Quick Starter Guide to Snow Sports. The first things to consider when choosing the length of your skis are your own height and weight. The length of your skis will fall within a range according to these factors. Skis and snowboards are designed to spread out your body weight so you don’t sink into the snow. The more surface area available, the less friction and the faster you will go. In the past, skis were long and skinny. Today, the trend leans toward shorter skis, which are easier to turn. These shorter skis are made wider at the ends to compensate for the smaller surface area. Your height affects your weight and your center of gravity. Taller and/or heavier people need longer skis to account for their higher center of gravity and the greater pressure they exert on the ski. The lighter you are for your height, the shorter your skis will be. Depending on several other factors, your skis will be anywhere from half a foot (15cm) shorter to just a little taller than you. Powder 7 Ski Shop has a handy guide to help you with this starting point based on your height and weight. It’s common to see snowboards that are a little shorter. Their height might fall anywhere between a person’s chin and their nose. Keep in mind that the snowboard length is more dependent on your weight than your height. 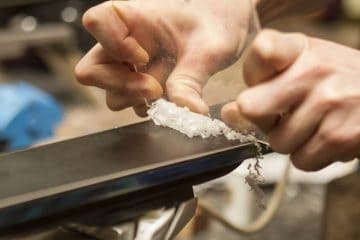 Skis.com provides a guide for finding the range of length for your snowboard to match your weight. Remember that with a snowboard, your waist width will be limited by your foot and hence your binding size. People with bigger feet will need a board with a wider waist. This will affect the sidecut of the board and its length. The next thing to consider is your ability level. This one is pretty straightforward. Beginner skiers and boarders will want shorter skis because they are easier to carve. Advanced and expert riders have the strength and skill to control longer skis or boards. They will also better appreciate the stability these afford at high speeds. An often-used benchmark for beginner skiers is to select skis that come up to between their chin and their nose. More advanced skiers should select skis that come to between their nose and the top of their head or a little longer, depending on the type of ski. 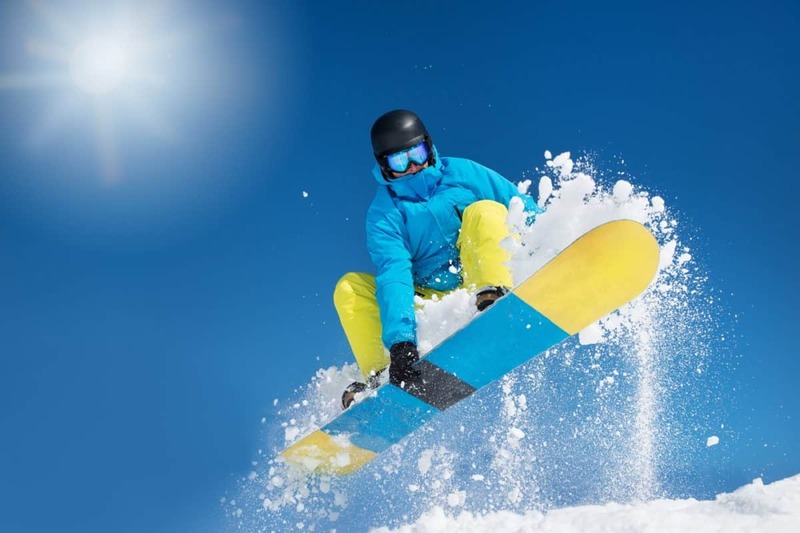 Snowboarders can start at shoulder height and work up to nose height or longer depending on terrain. In addition to being lighter and more flexible, women’s skis and snowboards are usually shorter to account for the lower center of gravity and lighter body mass compared with their male counterparts. Women exert less force on their equipment and benefit from skis or snowboards that are easier to turn. 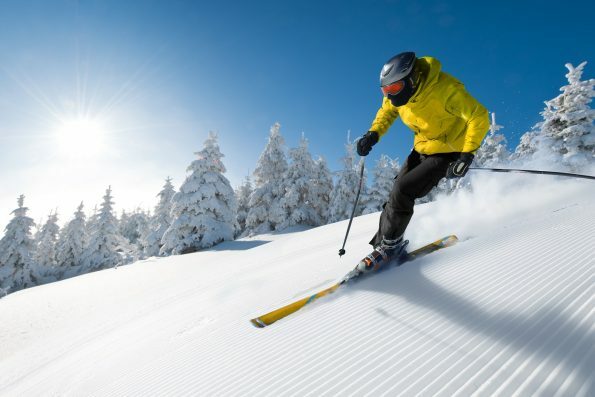 For first-timers, skis can sometimes be a little shorter which may only reach below the shoulder height. Otherwise, the same factors apply to kids as adults. Keep in mind that if your child is going through a growth spurt, it might be a smart idea to invest in equipment that they will grow into over the season. If you plan to ski or ride fast or aggressively, remember that longer is better. This will keep you steadier. 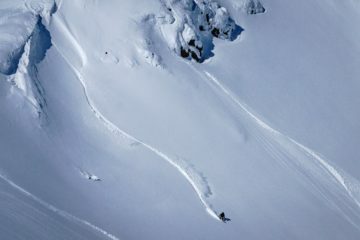 Skiers and boarders who do a lot of moguls as well as those who like making tighter turns should choose shorter skis or snowboards with a smaller turn radius. Shorter skis and snowboards offer better control over turns but less stability, so they are also suited to the less experienced and less aggressive. An important factor in a ski or snowboard is the effective edge or the length of the ski or board that actually touches the mountain. The edge is what allows you to grip the snow. An edge that’s too short could cause you to lose control; while too long ones make it difficult to turn. Different skis and snowboards feature different mixes of rocker and camber, which impact the effective edge. Traditional all-mountain skis and snowboards feature “camber,” a term which describes the way they bend up in the middle. Cambered skis and snowboards provide “pop” and are good for carving. When you dig your boot into the hill, the plank flattens out and you have a long effective edge with good grip. If you use cambered skis or snowboards, you can buy slightly shorter ones because the effective edge is comparatively long. Slalom skis are even shorter with an even deeper sidecut, allowing for tighter turns. In fact, slalom skis usually only measure up to 65″ (165cm). “Rocker” is the opposite of camber. This is a ski or board that curves up at either end. Powder skis and freeride snowboards are usually rockered, allowing them to float on top of the snow. Since the effective edge is naturally shorter on rockered skis and snowboards, you can use a longer rockered ski than if you were skiing cambered. Twin tips skis and snowboards are raised at both ends. Skiers who use twin tip skis should choose slightly longer models to compensate for the reduced effective edge. One factor closely related to your ski length is the turning radius. This is based on the sidecut of the ski – the amount that the ski cuts inward next to your foot compared with how much it flares out at the tips. Skis with deeper sidecuts have smaller turning radii, meaning that if you were to follow the curvature of the sidecut all the way until it completed a circle, the radius of that circle would be smaller than in a ski that is straighter all the way along the edge. The radius inevitably increases as the ski gets longer. The waist of the ski can only be so narrow. So, skiers who want a short turning radius must choose a shorter ski. Skis with deep sidecuts respond more quickly to your shifts in weight. They also naturally carve out shorter turns. These skis are designed for things like slalom racing, moguls, beginners and people who like carving out beautiful turns. Skis with longer turning radii carve out bigger turns and are usually used in speed skiing and jumping, which require no turns. They are also popular in off-piste deep powder skiing, where their bigger surface area helps them stay “afloat” without sinking into the snow. These skis are more stable when you’re skiing fast. Racing skis for skiers going at extremely high speeds are usually longer, with less sidecut. This allows for very fast, almost straight downhill motion. Normal slalom skis are short, with a deep sidecut for tight turns. The next shortest are frontside skis, designed for groomers and people who probably won’t go very fast. Freestyle snowboards are usually rockered and twin-tip, but nevertheless tend to be on the shorter and lighter side for better maneuverability in terrain parks. All-mountain skis are the most versatile and perform well on groomers and fresh snow alike. They can be a little longer than frontside skis. Slightly fatter than all-mountain skis, all-mountain/powder skis can handle a little powder and are slightly longer than all-mountain skis. Twin-tip freestyle skis have a shorter effective edge, so you’ll need a longer ski to compensate. But, you don’t want them to be too long as they might become difficult to maneuver. 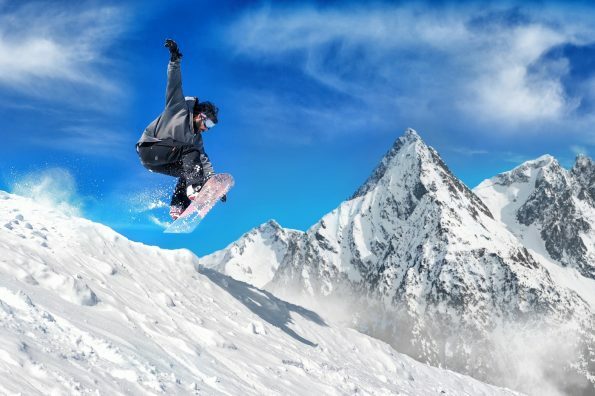 The most popular snowboards are all-mountain snowboards. These are of average length to allow the rider to handle anything from groomed trails to some powder. Powder skis and big mountain skis for backcountry skiing should be quite a bit longer to provide more control and to allow you to float on top of the snow without sinking. Snowboarders who want to freeride in the backcountry, whether on a freeride board or a splitboard, will also choose a longer board. Longer skis and boards also have the advantage of being “damper,” meaning they cushion you better from bumpiness over uneven terrain. The longest and skinniest are racing skis and alpine snowboards, which are recommended for smooth carving and stability at high speeds. These days, ski and snowboard manufacturers have branched out into all types of designs in various shapes. When buying one of these specialty boards, ask how the specific features affect the length. This short video by Level 9 Sports explains how to size skis according to your height, ability level and the terrain you like to ski. If you’re a snowboarder, check out this video that explains what snowboard length to choose. Along with the guide, you'll get exclusive content in our newsletter to help you make the most of your time on the slopes!